← How Do I Make This Work? Pictures + handful of words = nearly wordless. Yes. Those are his shoes. But wait. It gets better. Wow. That's a lot of shoes. 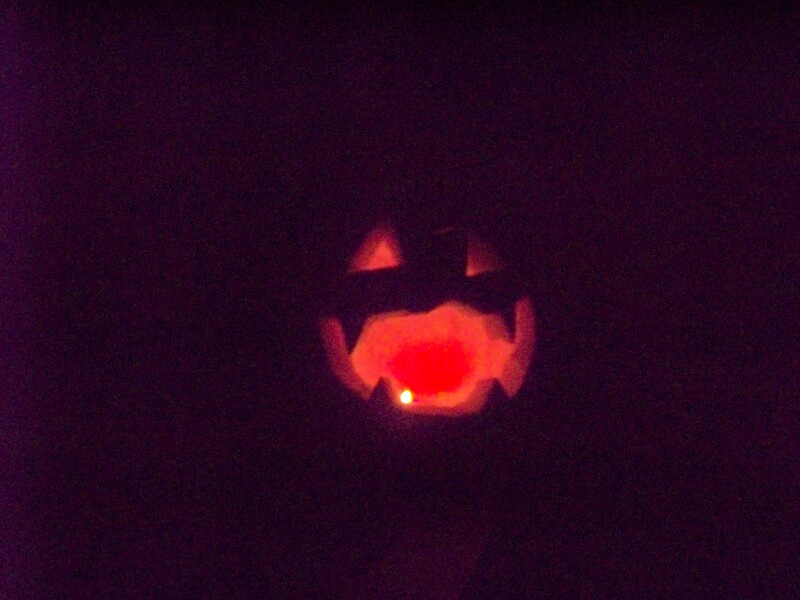 To stuff into a jack o'lantern. So exactly how many shoes can one jack o’lantern hold? Four pairs. Plus a four-foot nylon leash and a flexi-lead. But that’s all. Please don’t ask why he does that. The answer is simple. Because he can. 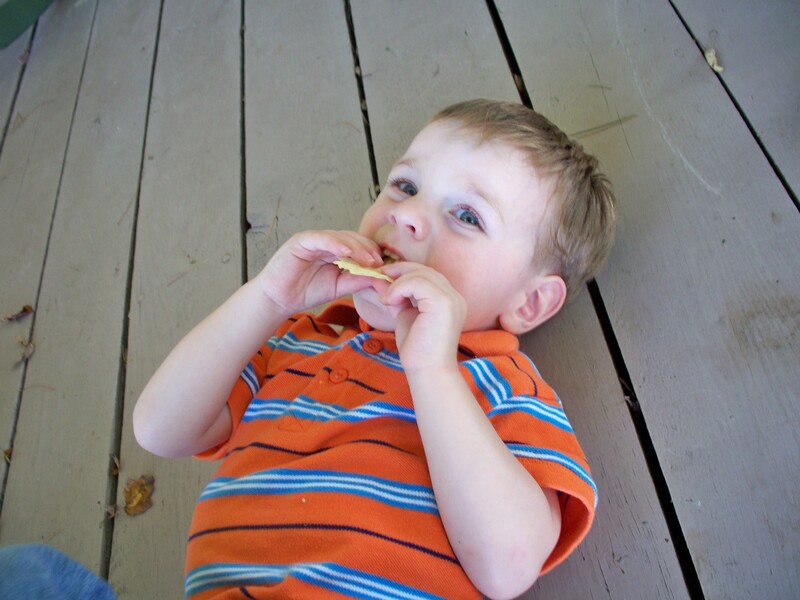 Where's a good place to hide this cracker. OR my shoes. What about a pumpkin? I love the ingenuity of the storage place. 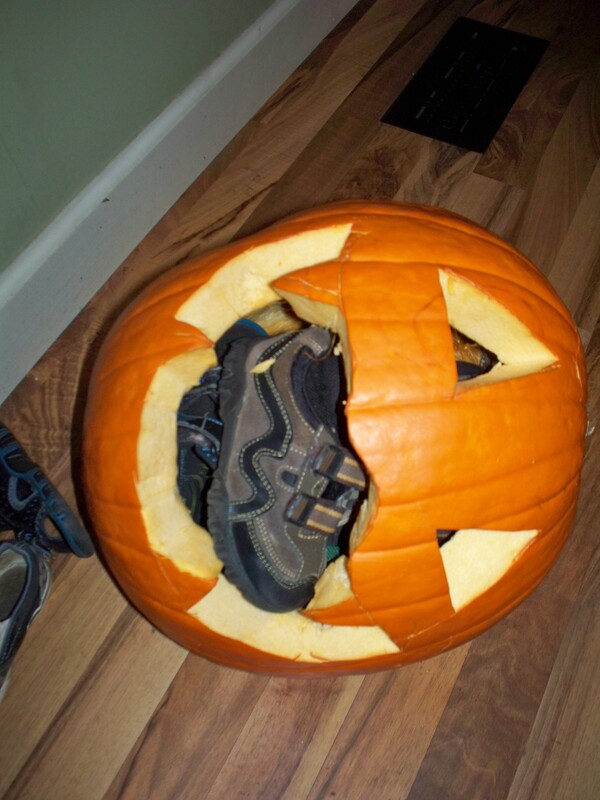 See, now you know that it’s possible to fit 4 pairs of shoes in a jack o’ lantern. Would you have ever made this discovery without his efforts? Never. And who knew that a jack o’lantern could double as storage space? Ha ha haaaa!!! So resourceful! Looks like he was taking advantage of unique storage opportunities! Man, I love that! 🙂 Made my day! I love that he did it all with such care that he didn’t even break the teeth. That’s some precision. He’ll be packing us for our next trip out of town. That is great. I have to show it to my 5 yr old. He will be upset he didn’t think of that!! There’s always the Thanksgiving turkey carcass. And now your shoes will smell pumpkin-ey delicious! Double score! Oh, no! I never even thought to sniff them! 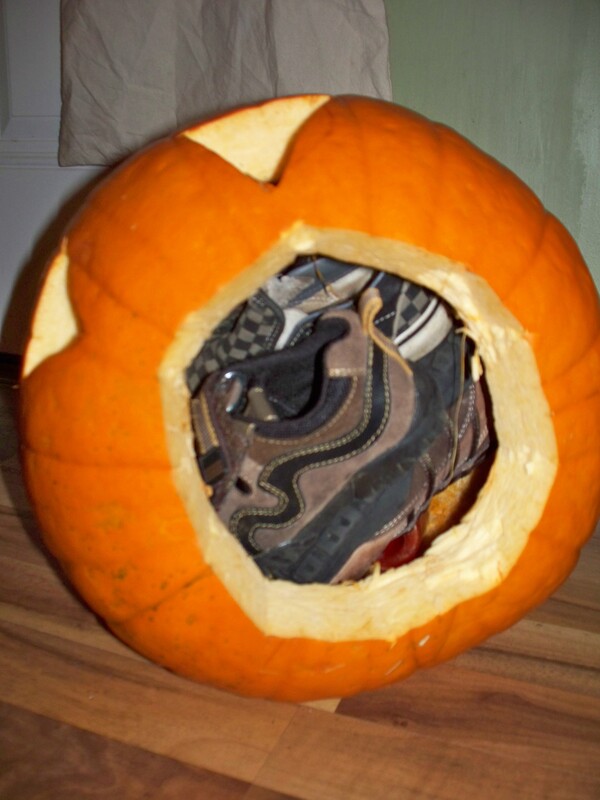 I’ve never thought about this before but, d’you know, I think at age 60 I, too, might like to try stuffing a pair of shoes into a pumpkin. Is that sad, or what? Sometimes it’s okay to embrace the child in us. But when you’re over the age of 30, people see your shoes in a pumpkin and wait for you to start collecting cats. Er, that was ’60’ not ‘601’. i wish i had a shoe rack like that……. It really does match the walls.